How to deploy Visual Studio 2010 web application project with SQL database using Web Deploy? 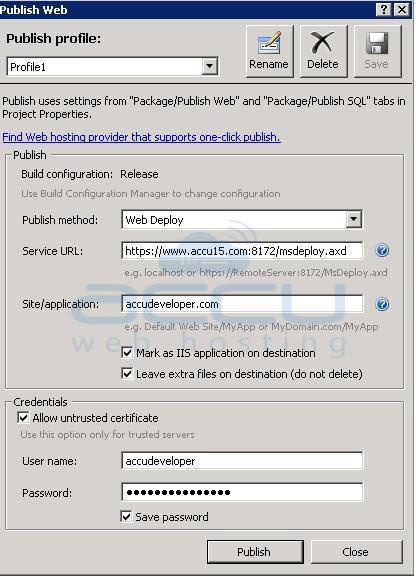 This demonstration shows how to deploy Web Application project of Visual Studio 2010 having SQL database using Web Deploy method on AccuWebHosting server. Open the project in Visual Studio 2010. First of all, change the Configuration settings of your project. In general, the status is set to Debug but for deployment you need to change it to Release status. From the Configuration Manager Dialog box figure out Active Solution Configuration option. From the drop down menu select Release status and then close the dialog box. Specify profile name if you want to change it otherwise by default it is Profile1. Change Publish Method to Web Deploy. For the local servers, use the name of the website and application as specified in IIS Manager. Check "Mark as IIS application on destination" option. In the Username and Password field specify your Control Panel login username and password that has been given either by your Administrator or by your Hosting Provider. 1. The value of "Service URL" for Windows Shared Hosting plans are as below. 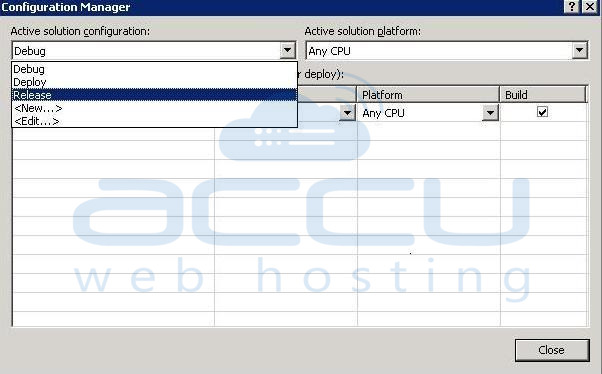 Windows 2012 clients is - https://www.accu17.com:8172/msdeploy.axd. How to install third party tools for your domain? Where can I find the website statistics feature on the accuwebhosting.com client area ? How to deploy Visual Studio 2010 web application project using Web Deploy method? How to deploy WebMatrix Beta web application project using Web Deploy method?